Used with gumbos or any rice and gravy dish in Cajun Country, chayote is a gourd-like squash that is about the size and shape of a very large pear. The skin is pale green and smooth with slight ridges that run lengthwise. Many compare the color to a light green apple. The flesh is white and there is one soft seed in the middle. Chayote is also called mirliton and the French call it christophene. Be sure to use a non-metal pot – or a coated metal such as teflon, silverstone, or enamel, without scratch or breaks in the coating to heat the vinegar. The metal will react with the vinegar and makes the pickle solution turn cloudy. You could add green tomatoes cubed or small pickle cucumbers in place of or with the mirliton. Wash, peel and cut chayote into strips, discarding the cores and seeds. Slice the onions and cut the pepper in strips. Notes: Some also use the core; not as crunchy but the taste is sweeter and lighter. Combine vinegar, salt and black pepper in a Dutch oven or large saucepot. Bring to a boil, stirring to mix ingredients. Add red pepper. Place the chopped vegetables (mirliton, onion, bell pepper and hot peppers) in the pickling jars. Fill the jars with the hot liquid to within one half inch from the top of the jar. Remove air bubbles and adjust liquid as needed. Wipe rims of jars with a dampened clean paper towel and apply two-piece metal canning lids. Process as needed. 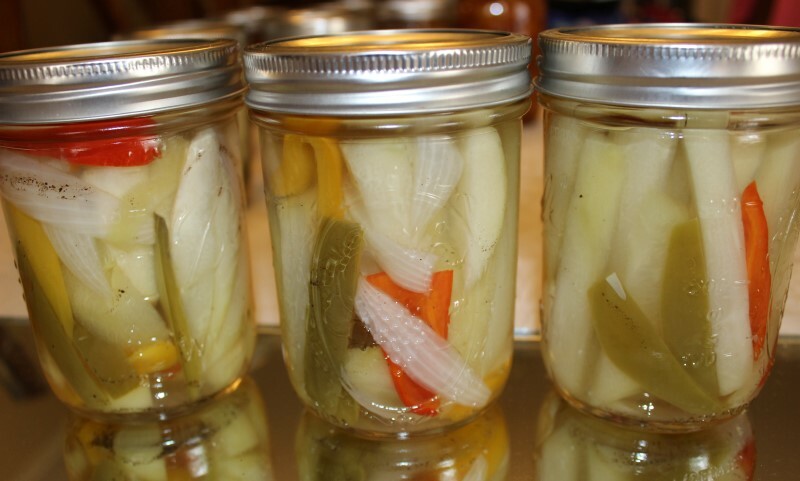 Allow the jars to refrigerate for a few days; the flavor gets better with some age.